Life is unpredictable. Why would death be any different? Sixteen year old Samantha’s Dad died in a sailing accident and her Mom’s moving them to the sleepy, backwater town of Beaufort, North Carolina, so they can make a new start. Afraid to sail again, Samantha takes her mind off the past by trying to solve the mystery of who's killing young women on the island, only the killer is way more than your ordinary psychopath. Turns out, the blood-thirsty ghost of Blackbeard returns to Beaufort on the high tide to collect the souls of beautiful young women and now he wants her mom. With only the help of a two-bit psychic and the ghost of a young, drowned sailor she might be falling in love with, Samantha struggles to save her mother. But Sam has some demons of her own to conquer first. 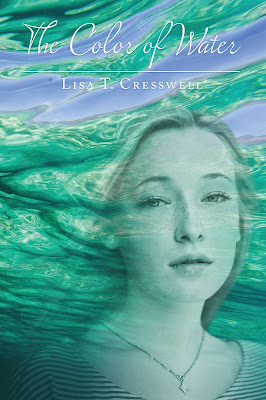 A big Geek welcome back to Lisa T. Cresswell, who was kind enough to guest post today and introduce her new release, The Color of Water. I love Lisa’s writing, and adding in a southern gothic element with ghosts? Oh yeah, baby. I’m so there. Don’t forget to enter the giveaway too! I love the sea. I’ve always loved it, although I haven’t always lived near it. I once thought I’d grow up to be an oceanographer or a marine biologist, but fate had other plans for me. And truth be told, the ocean can be a frightening thing. I’m always in awe of the men and women who are brave enough to sail it. I enjoy riding in boats, but I’m always glad to get back to dry land. I’m truly happiest on a beach. My latest southern gothic novella, The Color of Water, was inspired by a trip to the North Carolina coast a few years back and a visit to the historic town of Beaufort. Beaufort is just about as old as a town gets in North America, founded in 1709. It’s seen the Revolutionary War, the Civil War, and everything since. With all that history, you can imagine what a great graveyard it had. And ghosts. Lots of places in North Carolina have ghosts, but Beaufort has the best in my opinion. Pirates, merchants, soldiers, and little girls – there’s just about any type of ghost you might want there. So Beaufort combines two things I adore – the ocean and history. When I visited, I knew immediately it would be the setting for my next book. The Color of Water is a novella, so it’s the perfect length for a rainy, fall afternoon, cozying up on the couch with a ghost story. Fans of love triangles and super sweet teen romance may be disappointed. The story is very much about the ebbs and flows of life and death, about holding on and letting go. It’s also about the connection of a parent to a child, so while there are some elements of a first love, it’s also about much more. I hope you enjoy reading it as much as I did writing it. It’s funny what you notice when you’re dying. It’s not your breath or your heartbeat, or the ripple of your mind slowly coming undone. It’s what you love. For me, it’s the color of the water. First, it’s green like bottle glass. Then it’s deep, dark blue-black, like a midnight sky. And then something jerks me back. In the murky water, I can barely see what it is through my salt-blinded eyes. It’s Dad. He’s got me. He’s tugging on my vest, trying to unhitch the tether and I wonder why. Something breaks free and he pulls me up with him. The vest I’m wearing pops me up to the surface like a cork. On the surface, my lungs vomit out searing salt water, even as more angry waves bash us against the hull of the sloop. She’s completely upside down. Dad’s pushing my limp arms up on The Tempest, trying to make me grab a hold of something, anything to keep my head above water. You can always find The Color of Water on Amazon and Goodreads! and if you’d like to learn more about me, Lisa Cresswell, please visit my web site. Enjoy! Thank you so much to Lisa for jumping in with a guest post today! Great excerpt from the first chapter. I really hooks you. I too am happiest on the beach. There is something about water, especially water in motion, that is so mesmerizing and calming. The ebb and flow, the color changes from calm states to angry, fascinate me. I can’t wait to read and be fascinated by The Color of Water. I’m with you, Deborah – there’s not much better to soothe the nerves than your toes in the sand and the hypnotic lull of the ocean. Good luck in the giveaway! Hey! Thanks so much for allowing me to guest blog, CJ! When I wrote the book, I really did hope to convey the beauty of the ocean and the North Carolina coast. I love the Oregon coast too, but it’s very different from the east coast. My mom says reading the book is just like the trip we took to Beaufort, so hopefully I succeeded. I hope you’ll enjoy it too.